With almost every agency facing budget limitations, emergency managers being asked to do more with less. In response, many are having to become more innovative than ever before. In a sense, we are transforming into digital MacGuyvers by taking free, commercial-off-the-shelf software and repurposing it for emergency management. The reality is that when seconds count and lives are in jeopardy, your budget may only allow for one license of a particular software. The answer is to strategically re-examine our digital toolboxes with an eye towards shrinking budgets. When was the last time you did a technical inventory of your toolbox? Could we be using our tools to do more? Are we using all our technology the best we can? PHONES In the hunt for low-hanging digital fruit, the first item to consider is the ubiquitous desk phone. If we all have cell phones, why do we still pay for desk phones? Since most cell phones come with free long distance and roaming charges are almost unheard of, desk phones may be on their way to becoming an endangered technology. While it is always helpful to maintain technological redundancy, the need for dozens of analog phone lines is certainly lapsing. PERSONAL DEVICES As emergency managers become more mobile, some are finding it is more cost-effective to replace desktops with laptops and replace some laptops with tablets. Other jurisdictions are giving in and adopting a “BYOD”, or “Bring Your Own Device” policy. In an environment in which personal devices often surpass the abilities of government-issued technologies, it is no surprise that many employers are making the shift to allow employees to use their own devices. ONLINE CONFERENCE TOOLS While mobility is essential, the irony is that travel budgets are disappearing. To overcome travel limitations, there are many impressive tools that are thankfully free. Skype, Google+, and PiratePad are all examples of free technologies for collaboration over distance. Another simple tool for overcoming travel limitations is Ustream. Ustream is a free service that provides opportunities for conference attendees to participate who cannot physically be present. The service improves transparency to meetings and decision-making. Best of all, Ustream is accessible from smartphones. VIRTUAL SERVICES Additionally, as more technologies move to “the cloud”, virtual services such as virtual desktops, servers and even virtual operations are all tools to consider in our toolboxes.For instance, virtual desktops provide the ability to have all of the tools that you need anywhere you can connect. The use of VPN’s (Virtual Private Networks) allows users access their employer’s documents and systems as if they are sitting at their workspaces. The ability to use virtual products like Dropbox, Box.net and Evernote is rapidly improving technological redundancy and resiliency. If an emergency operations center is flooded and its servers are destroyed, being able to utilize cloud-based redundancy can be a literal lifesaver. VIRTUAL OPERATIONS SUPPORT TEAM Another concept that is spreading rapidly is the virtual operations support team (VOST) movement. VOSTs are staffed by trusted agents using the aforementioned tools and others to remotely support incidents or planned events in liaison with those on site. Incidents and events generate enormous amounts of data. VOST members can provide expert care in filtering through the data and supporting the actual response and recovery from a virtual posture.. 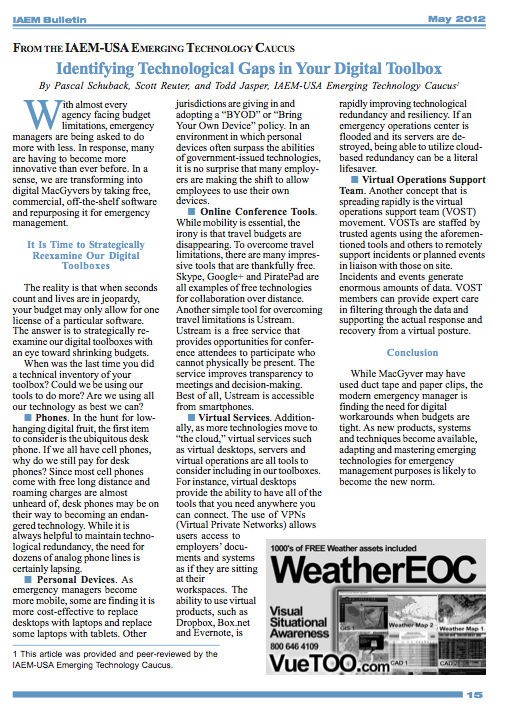 While MacGyver may have used duct tape and paper clips, the modern emergency manager is finding the need for digital workarounds when budgets are tight. As new products, systems and techniques become available, adapting and mastering emerging technologies for emergency management purposes is likely to become the new norm.